ONE OWNER! NO ACCIDENTS! BACKUP CAMERA, BLIND SPOT SENSORS, HEATED FRONT AND REAR SEATS, LEATHER SEATS, POWER DRIVER AND PASSENGER SEAT, FORWARD AND REAR COLLISION WARNINGS, RAIN SENSING WIPERS, REAR WINDOW DEFROSTER, TRIP COMPUTER, MEMORY SEAT, REMOTE KEYLESS ENTRY, BLUETOOTH HANDSFREE, STEERING WHEEL MOUNTED AUDIO CONTROLS, POWER STEERING, HEATED STEERING WHEEL, BRAKE ASSIST, TRACTION CONTROL, SECURITY SYSTEM, ALLOY WHEELS, AND MORE! Experience driving at it’s finest with this basically brand new CX-5 GT. It's a beautiful black and in fantastic condition, especially because we replaced the rear brake pads and rotors! The plethora of safety and convenience options will make your commutes the best part of your day! Enjoy what this sleek and powerful car can offer all for $30,800! 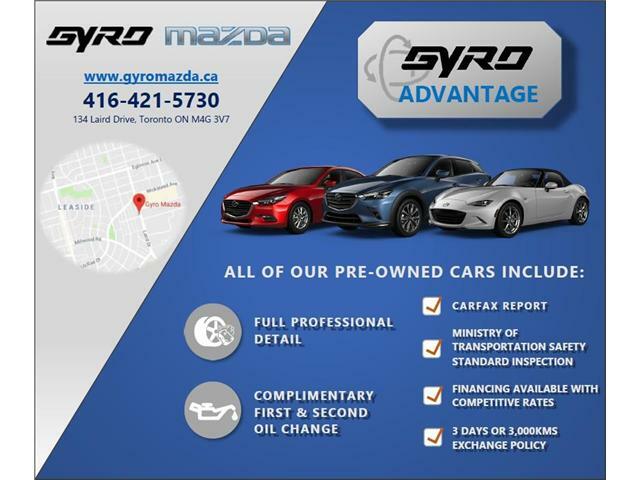 Come down to Gyro and experience a test drive, any of our knowledgeable product advisors would be happy to help you.